Ay, that post yesterday! Totally rambling Monday morning! My brother George even emailed me. "That thing about the Brussels sprouts, it was so ditzy, I had to read it three times," he wrote. I was initially shamed by that so today I almost deleted the whole post. Then I read it back and you know what, it is glorious in its ditziness, in its Monday morning-ness. I will leave it be. "What I have written, I have written." Pontius Pilate said that. Which, yesterday after two months I went back to Pilates class. Yikes, yikes, yikes and ow! So ran my thoughts throughout class. But of course I kept them to myself. It is funny about Pilates class. The class proves that women are stronger. Our Monday teacher, Susie, she dishes out crunch after crunch. Sometimes she stops exercising herself and just sits there and looks at us, issuing commands. "Forearm plank," she might announce. "30 seconds. Start." A forearm plank is when you are on your stomach and have to rise up on your forearms and stay there while Susie counts. Here is a picture of this strenuous and dehumanizing pose. Then there are roll-ups where you lie back with your hands over your head and have to curl up, slowly, until you are sitting up. It is easier if you are holding weights and you better bet that yesterday I was holding those weights. No way could I have done that without them! Observe a man in his underwear doing the roll-up. I was getting to why women are stronger. Throughout all these exertions I am keeping my moans and groans to myself. But the guys in class, they do not! "Oof," they are going. "Oh. Oooh. Ooof." And between that they breathe very hard to show that they are sweating. This does not annoy me. I actually like it. It is as if these guys speak for all of us. It makes me feel better when I am suffering through that Chair Pose to hear my Pilates friend Joe, on the mat next to mine, grunting and groaning freely. There was one Pilates class when Susie was pushing us and pushing us and finally, in the silence, one man went: "Jesus." Usually it bugs me when people say "Jesus" like that but I have to admit, that time I just started laughing. I absolutely could not help it. Because boy, I was feeling his pain! Yesterday the teacher made the mistake of saying, "And if you need to, you can get into Child's Pose." I was in Child's Pose before she was even done speaking, I will tell you that right now. Here is a picture of Child's Pose. It is my favorite pose! Throughout all this drama Susie was playing this CD with one of those singer/songwriters who strum a guitar and sing these long, aimless songs. They always play that in Pilates and it cracks me up. We used to listen to Ben Lee and he had a song that went, "Wake is the new sleep." He would repeat that like a kind of mantra. Ben Lee had another song called "Gamble Everything for Love." The calories I burned to that song! I start to sweat just listening to it. Yesterday this was a different guy. Over and over in this one song, he kept asking, "How do you feel?" Uh, I'll feel fine, after the 30 seconds run out on this forearm plank! Why couldn't they be playing this? Wow, that link. The first waltz. Is there anything more haunting in the world? All my gym drama took place at the Buffalo Athletic Club where Leonard Pennario used to work out when he was visiting Buffalo. It gives me strength, remembering that. Though I do not think anyone ever forced him into the forearm plank. Pennario would not have liked that, oh no no no. 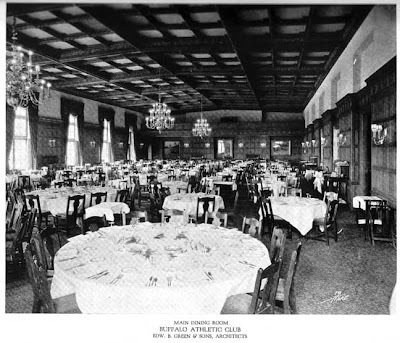 When Pennario went there, the Buffalo Athletic Club had that dining room pictured above. Like Proust, I weep like a child for the past. Over the years, I've run into variants of The Name. One, used by an old Chicago newspaperman, was "Geezoo." There's also "H. Sebastian God!" from The Front Page. A devout old fellow I know used to say "Ay, Yaysus" in stressful moments. There ya go; three possibilities for guilt-free venting. We were talking about that forearm plank at work the other day, although we did not know the name of it. I agree, that is murder to do although it would "seem easy" when explained to someone else, until that is, they try it themselves!!!! Next time I do the forearm plank I am definitely going to say, "H. Sebastian God!"